All finished stitching the blackwork version of the deer head silhouettes and really pleased with how it turned out. I’ll be turning it into a throw pillow on my next sewing and finishing day. The fabric is a Silkweaver Solo, 32 count Opalescent Lugana. I stitched the outline in 2 strands of DMC 986 the fill work was all stitched with 1 strand of the same. This is a WeeLittleStitches pattern from the Pixel People in Love collection. I’ve actually had this pattern for awhile, but I was missing a color so I hadn’t stitched it yet. Found the color I needed, so I pulled the pattern out and got started stitching it up. I was able to finish it this weekend while watching TV with my husband. The fabric is an old Silkweaver Solo and the floss is all DMC. I did swap a few colors – the yellows and the green are off a shade or two from what was charted, but I was pretty close so it seemed to work out okay. I used three strands of floss instead of the usual two, I wanted slightly more solid coverage since I want to work this into a pillow. I think I have some fun black and white quilting fabrics stashed away, so I’ll dig through my supplies and see what I can find to put this together next time I have a sewing day . 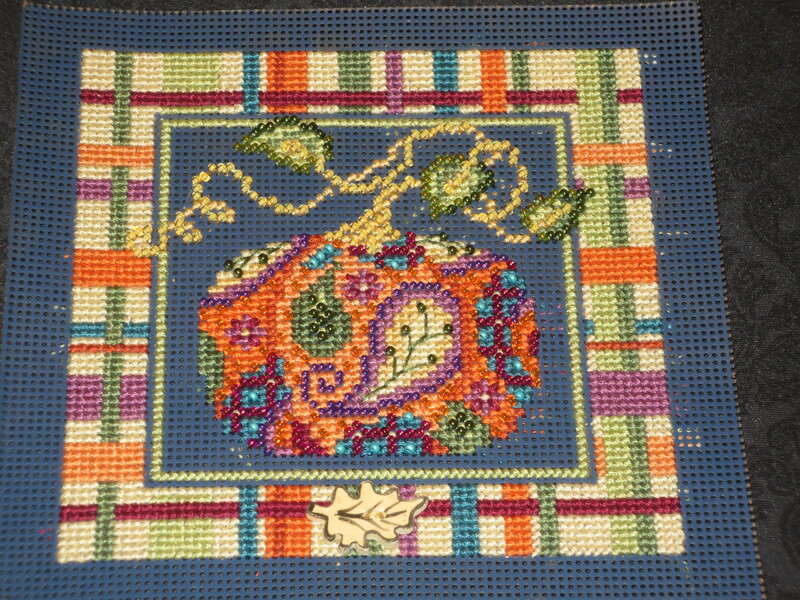 This was the Paisley Pumpkin beaded cross stitch kit from Mill Hill: I did all the beading this weekend, so it’s a finish! YAY! I had all the stitching done when I put away last Fall, but I didn’t have the space at home to sit down and work on the beading at the time. Since we moved I have plenty more space and I thought it would be a nice finish to get me back into the swing of stitching after a lengthy break. Actually, I finished it about a week ago, I just needed to get the pictures off the new camera and figure out all the settings and buttons. I’m still not sure where all the settings are on this tiny little camera yet. But, here’s my snowflake, finally finished. Lately I’ve been stitching on bigger projects and suffering from that blah feeling you get when you haven’t celebrated a finish in awhile. I’m sure you can relate to what I mean, that moment you want to finish something, anything at all. So I took a few minutes to dig through my stash and pull out some small charts that I keep on hand for just such a stitching emergency.